Left: Hike route from Ginostra to the summit and back to Stromboli town. 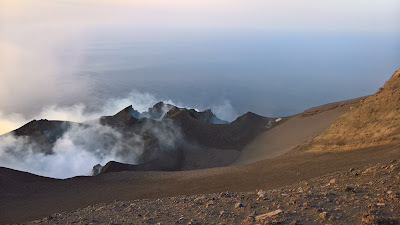 Right: Craters of Stromboli volcano just before sunset. 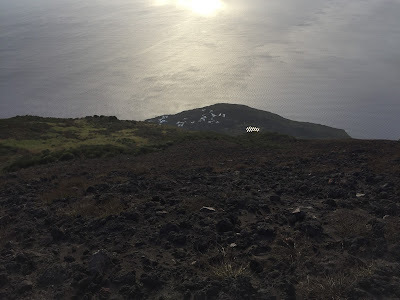 Elevation: 1.100 m gain/loss, starting at sea level we reached about 926 m.
The island of Stromboli has always held sway over my imagination ever since I first heard its name 25 years ago. 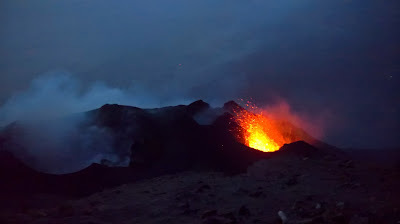 Who knows why these things stick in your mind, a mix of half-truth and half-fantasy, and a need to imagine a place - exotic, black lava, and with an unruly volcano will due nicely thank you - to take you out of your own dull existence. What's not to like about Stromboli, a volcano with civilization clinging to its edges. 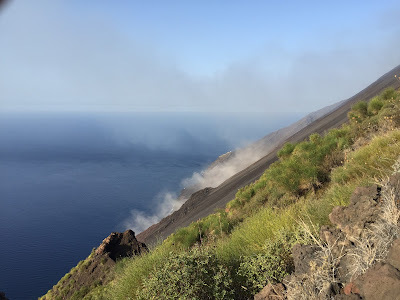 After all these years of Stromboli being in my mind and on my list of places to go, I can say that our visit didn’t disappoint. I would go back if the opportunity arose. I’ve never seen the movie Stromboli, terra di Dio (1950), which everyone asks when you say are your going or you went to Stromboli. 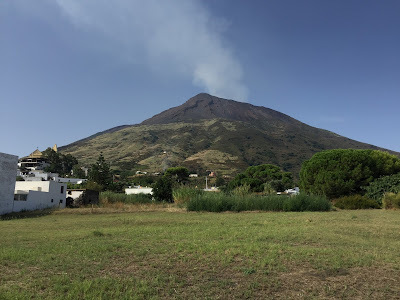 After this trip, I’ve taken to nodding my head and saying yes to the question, figuring that a good understanding of the plot and two days on Stromboli counts as equivalent to watching the movie, no? 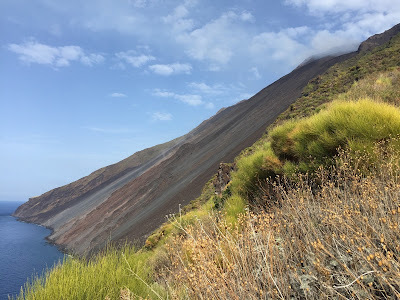 Okay, the hike to the top of Stromboli to see the volcano in action is the main focus for most visitors to Stromboli, as it was for us. We spent two nights (one and half days) on the island. 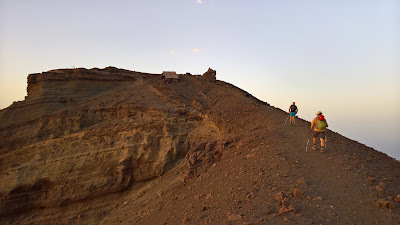 It would have been nice to have had at least one more full day, if not two, to explore the Sciara del Fuoco on our own by hiking up to the panoramic point on the north side of the sciara, which you can do without a guide (up to 400 m). 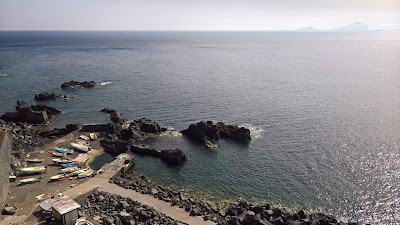 It would have been nice to explore the town some more, as well as explore more swimming options like the Spiaggetta di Adelaide, which we found on the morning of our hike. Views of Ginostra. Left: Looking back from the trail as we leave Ginostra through prickly pear (fica d'India) patch. Center: Ginostra port. Right: Looking down at Ginostra and its solar panels. 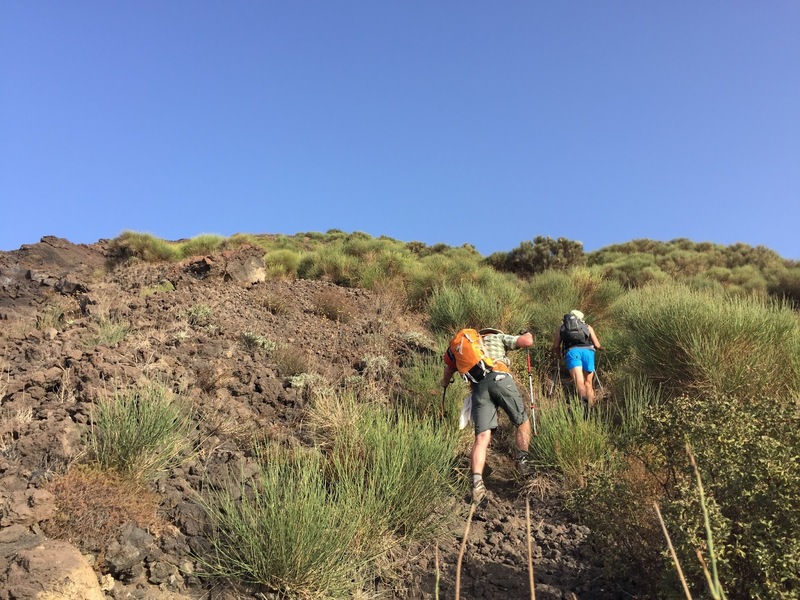 Stop rambling, details on the hike please! Okay, we ended up going with Magmatrek. We wanted to hike to the summit from Ginostra (via Punta d’u Cuorvu), because it was billed as a new route and less traveled. We found a detailed itinerary on the Volcano Adventures site, where we filled out the inquiry form. 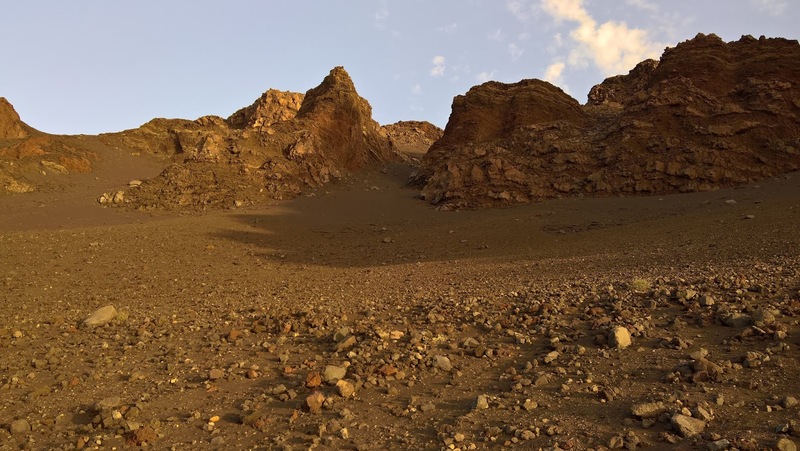 Somewhere along the line the tour was subcontracted to Magmatrek. I suppose you could just contact Magmatrek directly. All through the process, everything was handled professionally. We booked a few months in advance. One further point: we booked a private tour, just us and the guide. It’s more expensive, but the attention was more personal and, for us, more enjoyable. We met our guide at the Magmatrek office and took the boat with him to Ginostra. The climb from Ginostra to the summit was steep, and we worked up a good sweat for sure, but I wouldn’t say it was that hard. 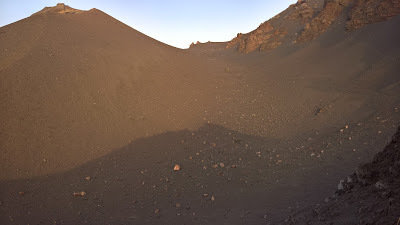 I’d say – on the theme of volcanoes hikes – the climb to the rim of Mount St Helens we did back in 2010 was harder. 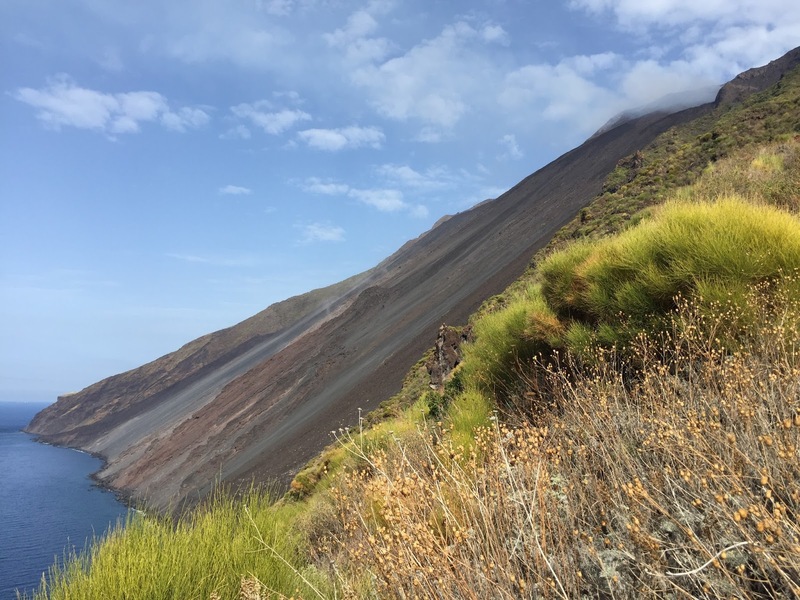 But don't worry, the guides for Stromboli are accustomed to pacing the hike with pauses, explanations, and time for photos. 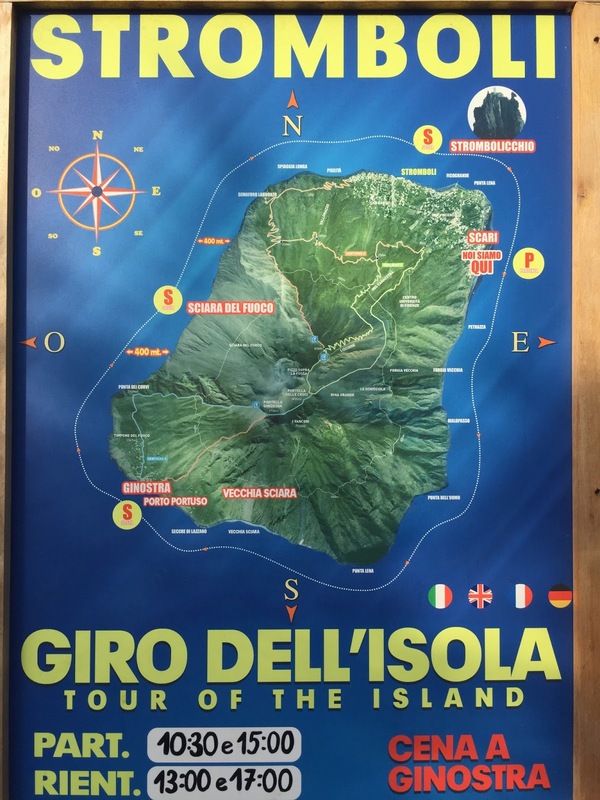 A good map and overview of the island is: "Discovering the island of Stromboli" by Vincenzo Moreno & Denis P. Demoriane shown below. Views on the way up. Route follows the edge of Sciara del Fuoco, shown on right. Did you see anything at the top? Why yes we did. 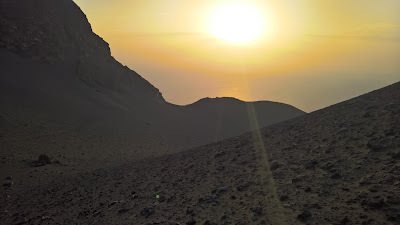 We arrived at the top (Pizzo) around 6:40 pm with a sunset at 7:05 pm. From the Pizzo we looked northwest over the craters, and were treated to small eruptions every 15 minutes or so. It was worth the hike up. Your mileage may vary: you may get to the top and see way more or possibly nothing. It’s the journey, not the destination, right? We started back down around 8:00 pm and arrived back at Stromboli (town) around 9:15 pm. What was it like coming down at night? We had a full moon or very close to it with exceptionally clear weather, so we started down with flashlights and then switched them off. In the moonlight, we giant-stepped/slid down the black sandy trail. It was a cross between skating and skiing, a beautiful sensation sliding our way down by moonlight. The light of the moon reflected off the ocean and the lights of Stromboli beckoned us in the distance. Everyone takes the same route down, and flashlights are usually kept on at all times. Since we were in a small group (2 of us and our guide) we could play around a bit. 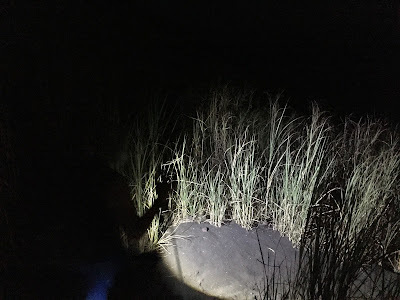 At some point, we hit vegetation* and we switched our flashlights on. The sliding part was over and we finished our way down through normal trails, albeit very dusty, so we put on some dust masks (provided). The vegetation we encountered on the hike down was mostly the cane grass Saccharum spontaneum ssp. aegyptiacum (la canna d’Egitto). 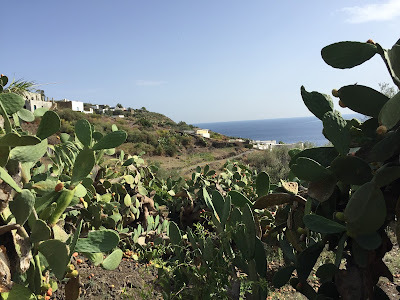 We saw an old photo – maybe in the museum in Lipari – showing very neatly cultivated areas, Malvasia grapes, delineated by this grass, on the slopes above the town of Stromboli. The photo we saw was likely taken before the destructive 1930 eruption, after which people left the island and cultivation was abandoned. Left: Descending at night from Stromboli, walking through cane grass Saccharum spontaneum ssp. aegyptiacum. 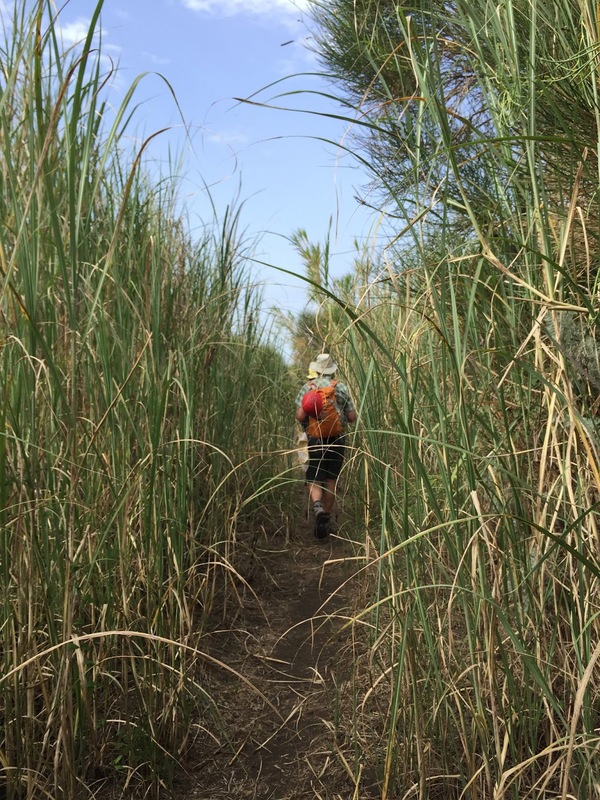 Center: Just above Ginostra at the start of the hike, walking through tall grass. Right: View of Stromboli volcano the morning of the hike. Note the cane grass on the lower to mid levels of slope - same area as in the left photo. Questa graminacea era stata un tempo introdotta dai contadini per essere utilizzata come frangivento e per delimitare i confini dei vignei. Con il declino dell'agricoltura, il Saccharum aegyptiacum ha colonizzato rapidamente i vecchi terrazzamenti, e oggi si arrampica dai pianori retrostanti l'abitato fino a quote comprese tra 200 e 350 m s.l.m., lungo le pendici del vulcano. This Graminacea had once been introduced by farmers for use as windbreaks and to delimit the boundaries of vineyards. 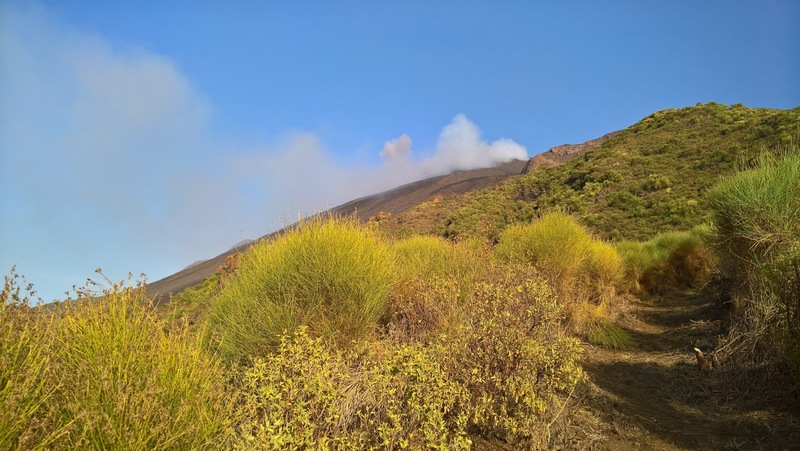 With the decline of agriculture, the Saccharum aegyptiacum rapidly colonized the old terraces, and now extends from the plains behind the town up to altitudes between 200 and 350 m above sea level, along the slopes of the volcano. Nel corso degli ultimi 3.500 anni, infatti, la presenza antropica ha determinato sostanziali cambiamenti nell'originaria struttura e composizione della flora, della vegetazione e della fauna: ciò si è verificato dapprima attraverso lungo un processo di domesticazione del territorio, rendendolo adatto allo sfruttamento agricolo, e in seguito con l'abbandono delle colture. I canneti che occupano la fascia basale dello Stromboli e che si spingono fino a 400-500 m di quota si sono infatti diffusi a partire dall'eruzione del 1930, quando anche gli ultimi vigneti vennero abbandonati e una larga parte della comunità lasciò l'isola alla volta delle Americhe e, soprattutto, dell'Australia; la canna d'Egitto (Saccharum spontaneum ssp. aegyptiacum), come suggerisce il nome, era stata introdotta per creare barriere frangivento e delimitare i poderi. Over the last 3,500 years, in fact, the human presence has brought substantial changes in the original structure and composition of flora, vegetation and fauna: first occurring through a long process of domestication of the territory, making it fit for agricultural use, and later with the abandonment of crops. The reeds that occupy the lower slopes of Stromboli and extend up to 400-500 m above sea level became widespread after the eruption of 1930, when even the last vineyards were abandoned, and a large part of the community left the island to the Americas, and especially Australia; the reed of Egypt (Saccharum spontaneum ssp. aegyptiacum), as the name suggests, had been introduced to create windbreaks and delimit farms. For a general overview of the flora and fauna on Stromboli, see the Italian Botanical Heritage site for the Isolie Eolie. 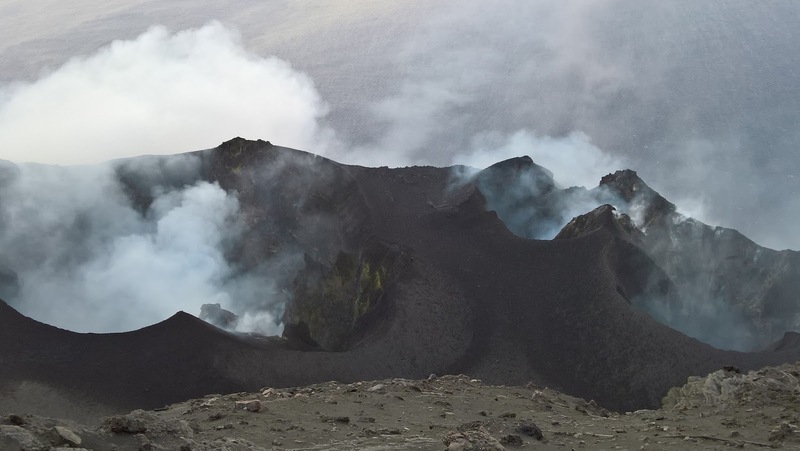 The Sciara del Fuoco and rocks and debris sliding down it. Stromboli crater photos from just before sunset until after. Stromboli "fossetta" - valley of the moon is what our guide called it. 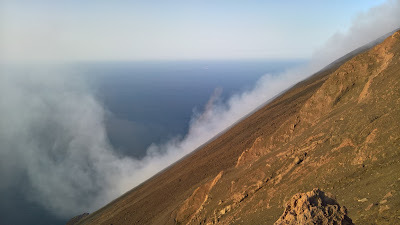 Left: Stromboli "fossetta" - with peak (pizzo) in the distance. 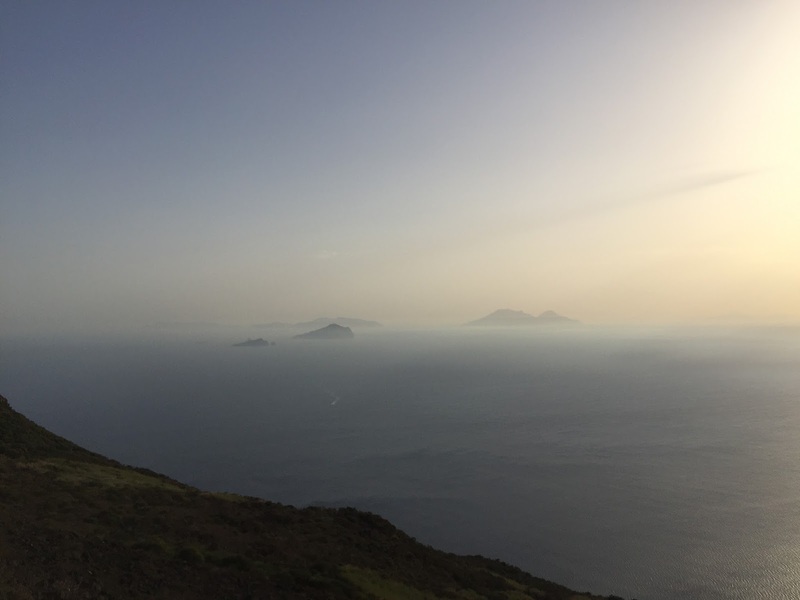 Right: View south toward the other Aeolian Islands. Left: Last bit of climb to pizzo, our viewing spot over the craters. Right: View of Vancori Complex. Maps of Stromboli. 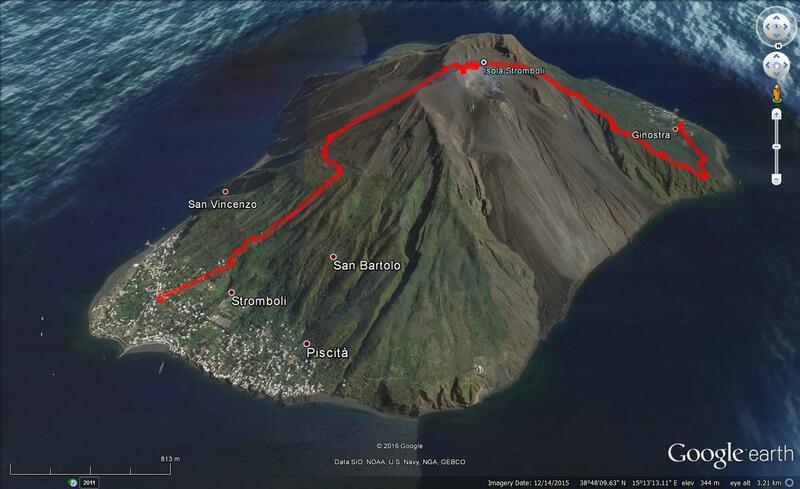 Left and center: Stromboli Excursions map by Vincenzo Moreno & Denis P. Demoriane. 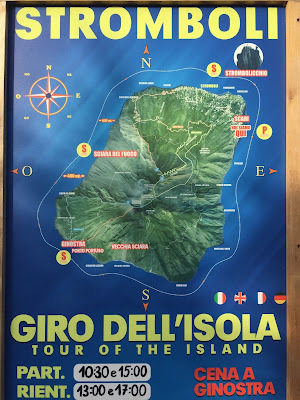 Right: A typical billboard in Stromboli advertising a tour (giro) around the island. 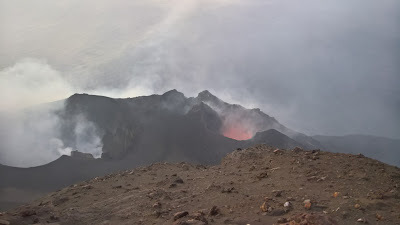 We visited Stromboli in 1998, no "tour guide" stuff etc. - I doubt this has to do much with safety. 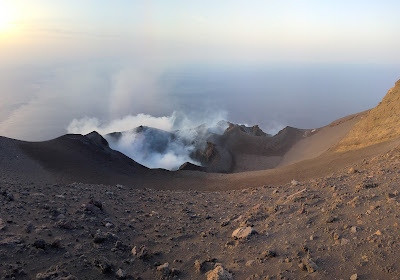 Annoyed me on Etna as well. In Iceland, nobody stops you from jumping into Geysit; common sense exptected; I like that.